Geothermal Power Plant In Hawaii Nearing Dangerous Meltdown? 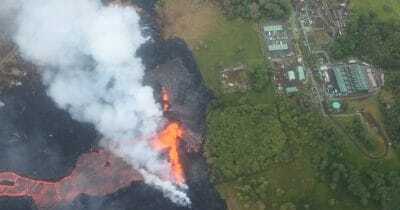 Lava continues to flow towards Hawaii’s PGV geothermal power plant. HAWAII - If lava reaches Hawaii’s PGV geothermal power plant, it could release of deadly hydrogen sulfide gas. That’s the latest potential danger from the Kilauea volcanic eruption in Hawaii. Residents now fear that lava flow will trigger a meltdown at the Puna Geothermal Venture (PGV) power plant that would release even more toxic gases into the air. Nobody knows what will happen if lava engulfs the PGV because magma has never engulfed a geothermal power plant, Reuters reported. A geothermal power plant uses steam and gas heated by lava deep in the earth to run turbines that make electricity. The PGV power plant produces 25% of the power used on Hawaii’s “Big Island.” The plant, considered a source of clean energy because geothermal plants burn no fossil fuels, and produce little pollution under normal circumstances. The fear is that the lava would release chemicals used to make electricity at the plant. The PGV has been shut down and authorities moved an estimated 60,000 gallons of flammable liquids away from the facility. They also shut down wells that extract steam and gas used to run the turbines. Another potential danger is that lava would open the wells and release clouds of toxic gases from them. The wells are typically sealed to prevent the gas from entering the atmosphere. The most significant threat is hydrogen sulfide, a highly toxic and flammable gas that is colorless. Hydrogen sulfide normally has a rotten egg smell which people might not detect when the air is full of smoke. That means people can breathe hydrogen sulfide in without realizing they have been exposed. The greatest danger from hydrogen sulfide is pulmonary edema; the accumulation of fluid in the lungs, which causes a person to stop breathing. People have died of pulmonary edema after just a few minutes of exposure to hydrogen sulfide gas. Many victims become unconscious before the gas kills them. Long-term dangers that survivors of pulmonary edema face include brain damage. Hydrogen sulfide can also cause burns to the skin that are similar to frostbite. Persons exposed to hydrogen sulfide can also suffer from nausea, headaches, severe eye burns, and delirium. Children are more vulnerable to hydrogen sulfide because it is a heavy gas that stays close to the ground. The danger from geothermal energy extends far beyond Hawaii. The world’s largest collection of Geothermal power plants located at the Geysers in California’s Wine Country. The Geysers field contains 350 steam production wells and 22 power plants in Sonoma, Lake, and Mendocino counties. Disturbingly, the Geysers which located just north of the heavily-populated San Francisco Bay Area and just west of Sacramento. Problems at the Geysers might lead to significant blackouts because the field supplies around 20% of the green energy used in California. Another danger from geothermal power is earthquakes because many geothermal power plants inject wastewater into hot rock deep below to produce steam to run turbines. A geothermal project in Switzerland created Earthquakes by injecting water into the Earth, Zero Hedge reported. A theoretical threat is that quakes caused by injection would cause the release of deadly gases at a geothermal power plant. The dangers from geothermal power might be much greater than its advocates admit.